We’re going to discuss Oakley cycling sunglasses. When you finish reading this, you’ll be well informed about exactly what kind of Oakley eyewear you should get. The brand, with its more than distinctive “O”, has always been associated with sports and sports eyewear, but in the case of cycling, it has gone beyond just being eyewear. Oakley ranks as a company that offers some of the most athletic sponsorships in regards to the optical market. Oakley sponsored Greg Lemond, who was the very first American rider to win the Tour de France. Without a doubt, that’s a pretty good reputation. Since then, it hasn’t stopped being involved with teams and athletes on the international level. For all their accomplishments, they deserve a special shout-out on our blog. -A quick history of Oakley and its cycling sunglasses. -Some of the athletes sponsored by Oakley. 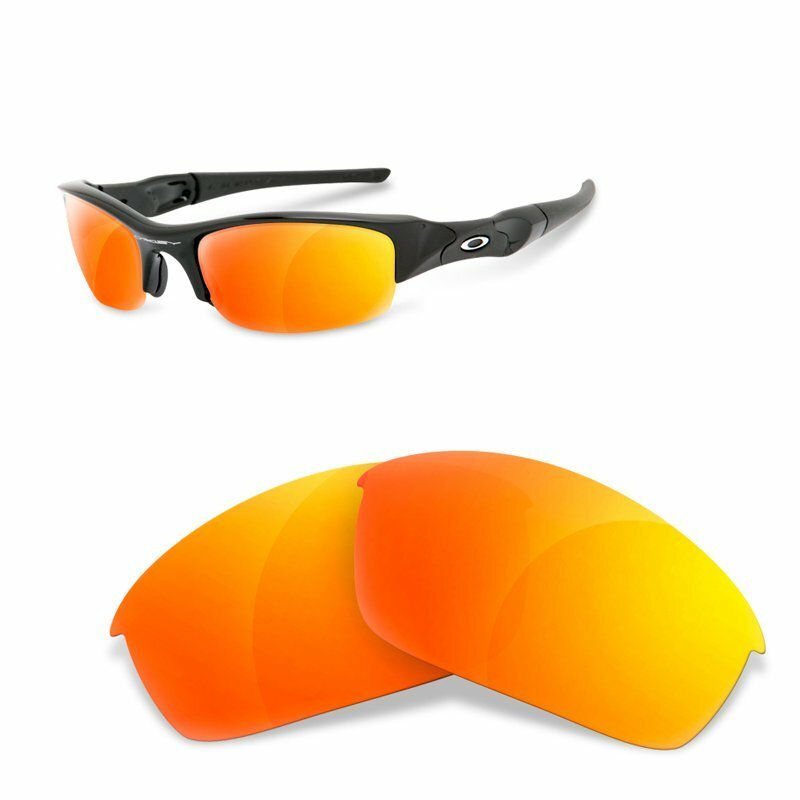 -Features and recommendations on how to choose the Oakley sports sunglasses for you. 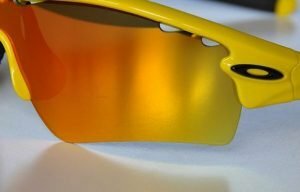 Greg Lemond was wearing the mythical Oakley EyeShades over his face when he wore yellow for the first time on Champs-Elysées. Half of his squad wore them, then they followed up by wearing the Razor Blades. A great model that became an instant classic. After these two hits, the competition got creative by darkening their brand a bit. By the mid 90’s, Oakley decided to get back out there again and create the M-Frame, a model that seemed to reinvent the old EyeShades. Oakley managed to put them on the face of a very famous American cyclist: Lance Armstrong. Ever heard of him? He and the entire Motorola team wore them and took it a step further creating a new generation of cycling eyewear. At the beginning of the new millennium, Oakley put out a bizarre model called Over the Top. No doubt, this model was considered “over the top.” It even appeared in Blade II. These glasses were followed by the Racing Jacket, which was made fashionable by George Hincapie. When the “Chief Commander” came back, after recovering from cancer, the Oakley Radar signified a new milestone in cycling eyewear. The Oakley Radar is considered to be modern cycling eyewear, so we’ll end Oakley’s history here, for now. There’s no logical order, but we are going to try to group the most popular Oakley models by family. What I mean to say is that the eyewear has names or similar forms. Just as the Jacket or the Radar. We’re not going to discuss the two near mythical models, EyeShades and RazorBlades, because even if (and that’s a big if) they can be found on the internet, they certainly are not functional today. If you’re interested in any pair in particular, here you will find a list of all the Oakley eyewear we have mentioned. You can click the one you like the most to go directly to its section in this article. Supposedly, a re-launch, the public did not like this pair, as opposed to later models. Oakley set again as an emergent star in America like Lance Armstrong was. Either way, the M Frame had moderate success and is still around. Maintains the original retro design, with aggressive corners in the frame. The temples are flat and horizontal, with the O of Oakley imprinted on them. Sweep, Strike, Hybrid, and Heater. It obviously has interchangeable lenses. Oakley has its exclusive model, Prizm. They exist both ventilated and non-ventilated. They’re also ventilated and standard, from polarized to photochromic. It adapts well to any kind of face. The M2 Frame and the M2 Frame XL. Has a similar aspect, but you can see the differences on the following pictures. You can find the M Frame for €100 in eyewear specialist stores, and the M2 on Oakley’s Official website for €129. This model was developed during the change of century and its first designs are far different than what they are today. The Oakley Jawbone are sisters, almost twins, to the current Racing Jacket. 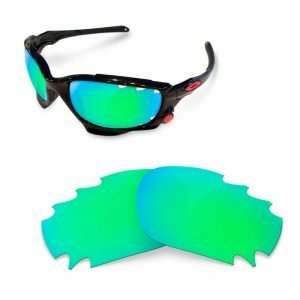 You can say that Oakley quit making the original RJs, developed the Jawbone, and later remade the Racing Jacket with an almost identical design to the later models. It has enveloping glass that is really close to the face. This is a great advantage for some. But it’s also inconvenient for others since it fogs up easily after a bit of sweat. There is a solution to the fogging issue that we’ll get back to in a moment. The Racing Jacket measures at 124 mm, which includes a bridge of 18mm between each ring. Temples measure at 126 mm. Rings height is at 40mm. If you want to know all the differences between this and the Jawbone, visit this article. The lenses are interchangeable through a curious system that we’ll show you in this video. Oakley has PRIZM Lenses for this model as well. Matching exists from polarized to photochromic, ventilated and standard. 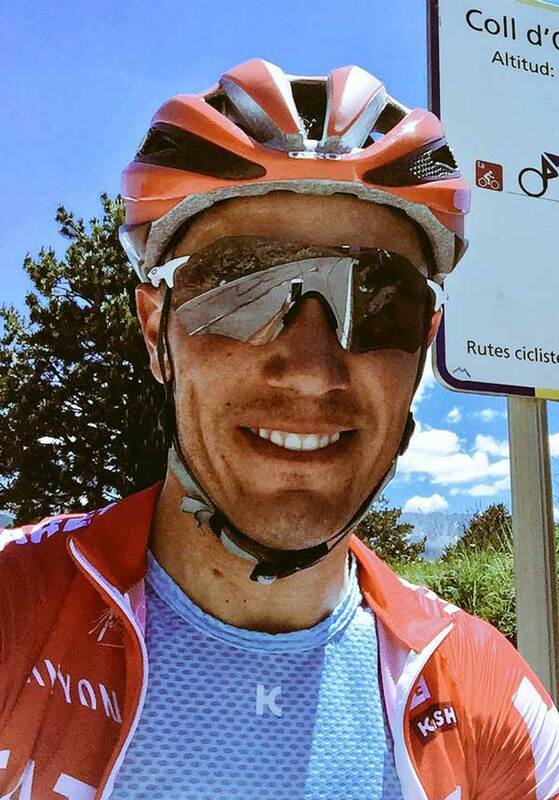 These sunglasses are used by professional cyclists as well. The most famous of which is George Hincapie. However, its higher market share and success has actually been with runners. Oakley doesn’t have the Jawbone available in its official catalogue, but the Racing Jacket has a price starting from €229. You can find them in other online stores ranging from approximately €140. The Split Jacket is a variation of the Racing Jacket and the Jawbone. It has a lens release system identical to the two mentioned models. It has very similar glass but is slightly smaller, with rougher angles. Interchangeable, there are polarized lenses, photochromic, ventilated and non-ventilated. All kinds of sports because of its great comfort and adaptability. With this special pair, we are going to discuss it a bit out-of-the-box, bullet by bullet. Because it has so many things to talk about and it would get pretty repetitive explaining everything. The Oakley Radar, with its different variants such as the RadarPath, RadarlockPath, Radarlock Pitch, Radarlock Edge, is a huge success. Without a doubt, the original Radar was a revolutionary pair of eyewear because of its lightweight frame, robustness, high range of vision, all with the possibility of exchanging lenses to boot. Oakley was smart by sponsoring Armstrong again. The rest of the cyclists took notice and got a pair for themselves. The Oakley Radar Path were the first ones. A revolutionary pair of glasses, these were extremely lightweight for its time, brewed with hypoallergenic materials, comfortable, and tough. Including a magnificent range of vision, it had it all. Well… almost. Although the lenses were interchangeable, it wasn’t an easy task. In the first models, the notches for loosening the screen weren’t well developed and proved puzzling for the first users. But, the model evolved and the later versions made everything easier. You can watch the process in this video. As humans are in a state of constant evolution, this cycling eyewear evolves as well. The revolutionary Switchlock system ensures that the lenses are exchanged with ease.. 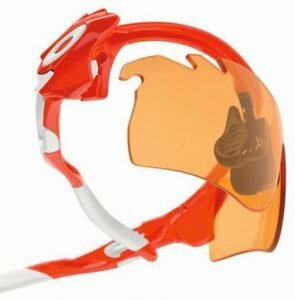 They simply added a removable part in the elbow of the frame (if you don’t remember what the elbow of the glasses look like, check out this article). Lifting SwitchLock easily removes the lenses. 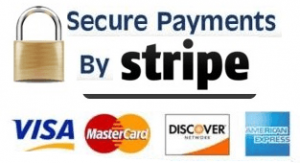 Since this innovation, it has created a huge variety of exchangeable crystals for the Radarlock. Many shapes of lenses also came up, that could focus on the different types of faces that could exist among the users. The Radarlock Path had a curve on the bottom of the lenses, in order to avoid sticking to the cyclist’s cheekbones, preventing contact to the face. Fogging of lenses and annoying rubbing against the glasses were avoided this way. Also, there is the Radarlock Pitch. It is a lens with greater height and length coming from the upper part to the bottom. These are clearly designed for larger faces. On the other side of the spectrum, there is the Radarlock Edge. This is the opposite of the Pitch as it has a more refined design and is curved in its external part. These are mainly designed for small faces and are very popular among women cyclists. It must be mentioned that the Radar just shares the same design as the Path, while the Radarlock has the two other features mentioned earlier. The lenses for all of these models, are obviously interchangeable and there are several types available; polarized models, photochromic, ventilated, PRIZM, etc. The Radarlock width is at 138mm. The rod’s length is at 131mm. For the Path Model, the lenses height is at 44mm. The Radar Path is no longer on the market. The Radarlock Path go from €120. The Radarlock Pitch go from €169. 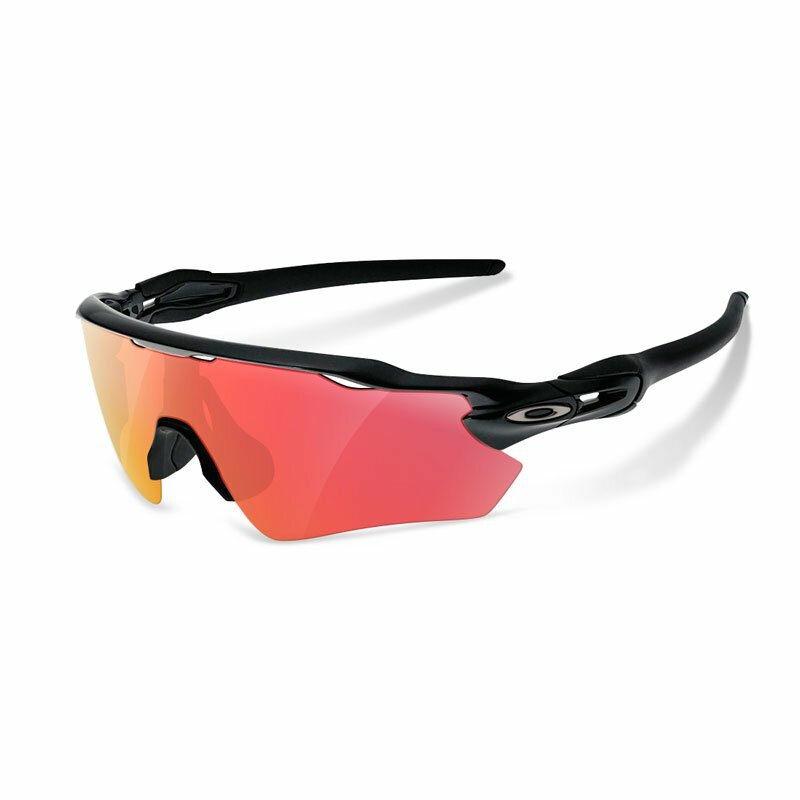 The Radarlock Edge: Oakley has discontinued this model. You have to find them in alternative marketplaces. Cycling as well as any other sport, from beach volleyball to golf, or even water sports. Let’s jump ahead a few years and talk about another Radar. These sunglasses went public not too long ago and the Oakley marketing department, managed to put them on the little face of yet another yellow maillot. Chris Froome began to popularize them among his great crew. Following the RadarLock, the EV has two forms. Radar EV Path: with the same curve design in the bottom. Radar EV Pitch: big lenses. Is a natural evolution of the Radarlock, because of the lightness of the components, and improved range of vision. 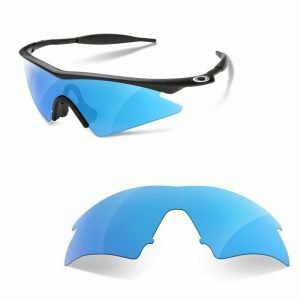 This particular Oakley model has had a hard struggle for its domain on the market because many competitors make their brand so similar to this model. 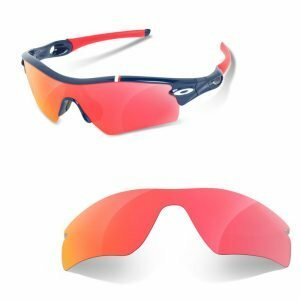 There’s a strong back and forth between Oakley and its competitors to make this model best suitable for cyclists, as well as other athletes. The glasses have a total width of 138 mm. The temples measure at 128 mm. Just like we said, there’s the Radar EV Pitch and Radar EV Path. Exchangeable, ventilated, and non-ventilated. Oakley has the Prizm. Photochromic, and polarized. All types of faces because of its adaptability and its varied lens sizes. Any kind of sport since its extremely comfortable and lightweight. On Oakley’s official website, they have them starting at €169. Now, hop in the Delorean and we’re going to go back in time like we’re Marty McFly. This Oakley model is a classic. One reason is because it has two independent lenses instead of a screen. Typically when you think of cycling eyewear, you think “sporty glasses with a screen covering the whole face.” Well…not these. The Half Jacket, in this case, is a model that has the advantage of being sports eyewear as well as street sunglasses. The rubber finishing of the rods are spectacular, and of course, the lenses are interchangeable. The goggles have a total width of 124 mm, with a bridge of 15 mm. The temples measure at 133 mm. Half Jacket: height of 36 mm. Half Jacket XL: bridge height of 42 mm. There are no ventilated lenses. Two sizes: Standard and XL. The Asian Fit version is specially designed for Asian faces and for arguably smaller faces. The other versions are recommended for large faces. The Flak Jacket is sporty eyewear similar to the Half Jacket. It is a little bit wider, allowing it to form naturally around more rounded faces. 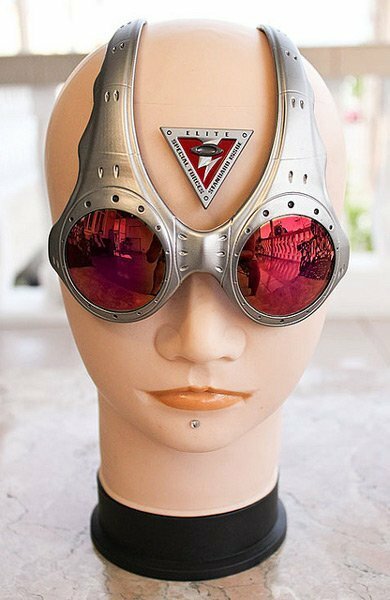 The design is not as good as the Half, and currently, there is eyewear out there that is much more ergonomic. Even so, it’s a good option if you’re looking for a sturdy pair of glasses as it is resistant to falls and fairly tough. The temples open “automatically” when they extend to a certain degree. The glasses have a width of 116 mm, with an included bridge of 22mm. The rods measure at 133mm. Alternatives are the Flak Jacket 2.0 model as well as the 2.0 XLJ. Polarized, photochromic, but there’s no ventilated alternative. They’re ideal for cycling and running. This pair can be perfectly used as street glasses. On the Oakley website, they go from €149. It’s difficult to distinguish between all these similar glasses. And in this article, we’re trying to highlight the differences a bit better. The Flak 2.0 isn’t the same as the Flak Jacket, even if they look alike. The Flak 2.0 is the natural evolution from the Flak Jacket. They differentiate from the Flak Jacket because of the rods as the Flak 2.0 rods are slightly curvier. It has a more revolutionary design and much more ergonomic finishes. It has a more sportier look than the Flak Jacket. Is this an advantage or just inconvenient? It’s slightly wider than its predecessor and according to experts, slightly more comfortable. Also has two lens sizes, standard, and XL. Remember that we always talk about two crystal sizes for the same glasses, the difference is in the vertical measurements. Even though it itself is a variant, we have to mention that it has the Asian Fit variant. The width measures at 128 mm, with rods at 133mm. 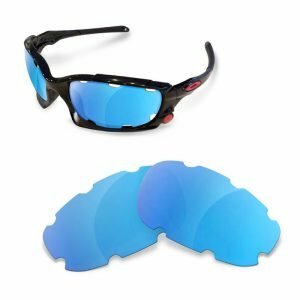 The lenses are interchangeable by applying pressure, it has the original Prizm lens, and there are polarized and photochromic ones, as well. This model has no ventilated lenses. It is important that you have clear Flak 2.0 lenses or else they won’t fit in the Flack Jacket. Since they are wider, they’re recommended for bigger and more round faces. These go from €149 on the official site, but you could find them cheaper at some online stores. We’re going to talk about these glasses even though the model has been discontinued. This is a peculiar model. You’ll just have to see it to believe it. Those two little holes in the upper and external part are locked in the frame. It has a lock and release system similar to the SwitchLock. Not surprisingly, this Oakley model was not loved among the public and as such, it has been discontinued. These glasses have a considerable width of 142 mm, with a bridge of 9 mm. The temples measure at 124 mm. The lenses are interchangeable through a similar system to Switchlock. Currently, only the polarized lenses exist. These are discontinued, so you can only find it in second-hand markets. Few eyewear has had such a resounding success as the Jawbreaker. 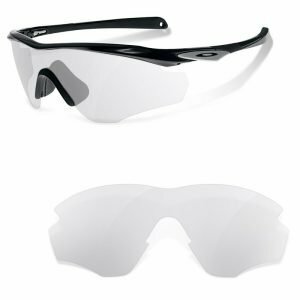 This model was developed by Oakley along with Mark Cavendish, who started a whole revolution within sports eyewear. After the British sprinter, practically half of the international squad wore them. It was the first cycling sunglasses that had a unique screen, but a complete frame. As in, the lenses are not mounted, they sit exclusively on the upper part of the frame. This allows it to have a greater height above any other. By being so big, these lenses allow having a range of vision even wider than the other models. These have a total width of 131 mm and the temples measure 121 mm. The total height of the lens is no more than 53 mm. They are interchangeable, but it’s not the simplest thing in the world to learn. On this video, we will show you how to use it. Any sport. We even use them as ski goggles. On Oakley’s official website, you can find them starting from 189€. There is a last variation of Radar, but this one deserves its own space. 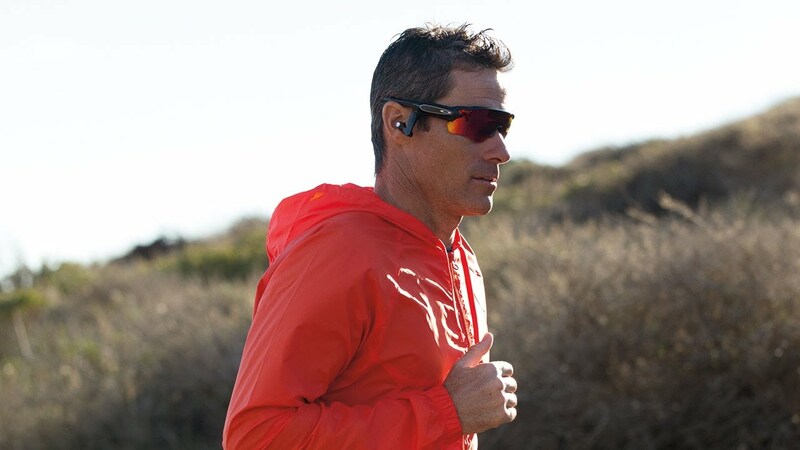 The Radar Pace was created to apply the latest technology onto a pair of Oakley’s. The Radar Pace incorporates rods, auricular connectors, and even a microphone. So it’s kind of like Google Glass applied to sports. It can synchronize with your mobile device and with an app that acts as a personal trainer. It measures distance, calories burned, etc. Just like Google Glass, you can “talk to Google” and ask it to start or stop training. You can even use it as a music player and a phone. The measurements are identical to the Radar EV. 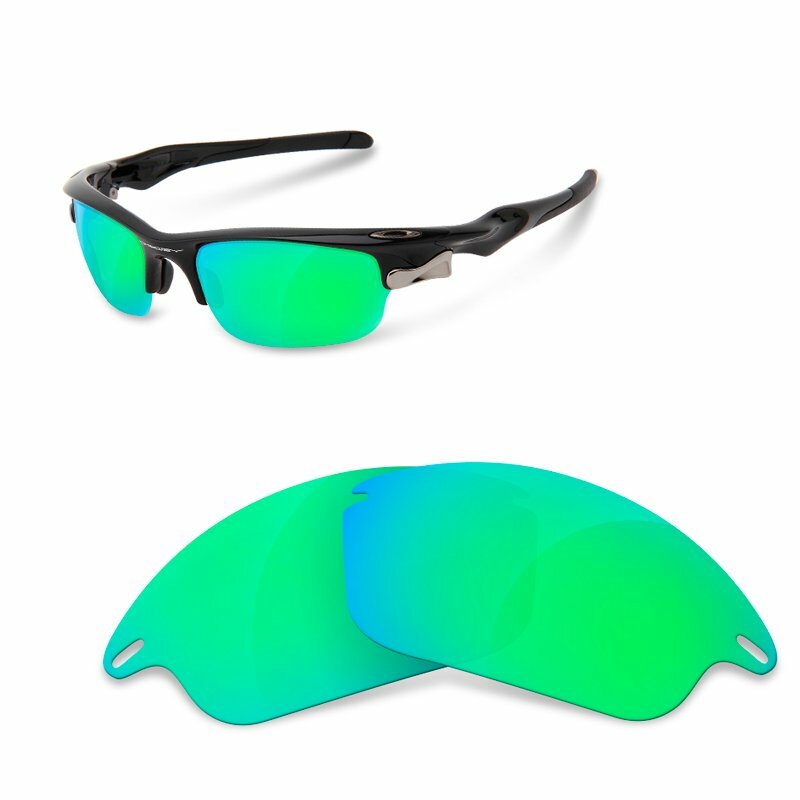 It has interchangeable Prizm and Polarized lenses. And, more importantly, for fans who like it when technology is applied to sports. It costs €439 on Oakley’s website. In this video, the glasses are shown in great detail. This eyewear is a recent release and Oakley released them in an attempt to offer a type of frame whose lenses can’t be exchanged. Meaning that if the glasses you bought get scratched, you have to buy a whole new pair. “Purito” Rodriguez was the first elite cyclist that wore these glasses. Phil Dalhauser, the mythical American beach volleyball player, also used them in the past Rio Olympic Games. 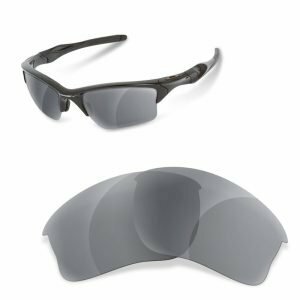 Oakley was the first company who created sports eyewear with exchangeable lenses, and these glasses offer an entirely different concept. Its main virtue is that these glasses are extremely lightweight. These glasses have up to 5 alternative models. EVZero Stride: comes in a small and large model. EVZero Swift: recommended for women. EVZero Pitch: slimmer profile lens and more suitable for small faces. EVZero Range: comes with a large lens with many edges. This model has some of the best ventilation. EVZero Path: the name “Path” indicates a bottom edge cut so it doesn’t touch the cheekbones. The lenses aren’t interchangeable but exist in almost all types: Prizm, photochromic, and polarized. There are no ventilated lenses, however. With a great variety of sizes and forms, they’re recommended for all facial types. In regards to sports, cycling is the star of the show. Dalhauser used them in his volleyball matches, but the lens suffers too much contact with the abrasive sand. And remember, you can’t exchange the screens on this pair. It costs €149 on Oakley’s website. Did you like our collection of information about Oakley cycling eyewear? There are other models that can be considered Oakley cycling sunglasses, such as the Bottle Rocket, the Turbine, the Crossrange, or the Tombstone. But we didn’t include them because they don’t belong in our “pure and tough” criteria of cycling eyewear. If you disagree, or if you believe that we’re missing another model that we didn’t mention in here, please feel free to leave a comment below. Please check our website in order to know more about our Oakley replacement lenses. And if you did like this article, please share it on social media. Very good collection. You were very informative as well. Thank you for all the description’s. To be able to get interchangeable lenses for various situations is awesome. It is really cool that you can listen to music or answer the phone with the Radar Pace.